I spent a portion of my childhood living at my dad’s house, just off South Carrollton Avenue. I attended the Uptown parades, dressed up for Mardi Gras, and I frequented Jazz Fest and several other festivals. I spent countless days wandering the French Quarter with my dad and step-mom; I participated in a contest to name the Crescent City Connection (I lost), and you might say I was a quintessential New Orleans kid. But I had a secret. I did not love New Orleans. It was quite the opposite, in fact. I much preferred the suburban life at my mother’s house. I was happier outside of the city limits, in our little cul-de-sac in Jefferson Parish. As I grew older, my contempt for the city grew as well. 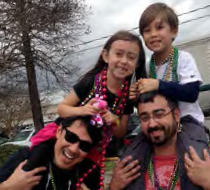 I became hardly able to tolerate parades, and, even then, I preferred those that rolled in Metairie. Although I was born and raised here, it never felt like home. I avoided the downtown area like the plague, and the last time I attended a festival was before I was old enough to protest. I thought for sure I would move away at some point. I planned to go out of state for college, but life had other plans. I ended up staying but consistently wanting to leave. us coming home. Then, after nearly two years and a twist of fate, my husband and I packed up our quaint apartment, and used the money we were saving to buy a house to move back to New Orleans. I do not know how much of it is the “new” New Orleans, and how much of it is my perspective, but, as the years go on, I fall more in love with this city. I love the oak trees. I love the beautiful Uptown homes. I love the relaxed, laissez-faire attitude. I love the waves and smiles from strangers. I love that everyone knows someone that you know. I love the shops on Magazine Street, the Frenchmen Art Market and the newly revitalized Freret Street. I love that New Orleans is truly a city that lives in you. Like most locals, there are still some things I would change about New Orleans, but I am happy to say that we are planting roots here. I have learned to never say never, but I have no plans to leave here again. New Orleans is a place I am proud to call home. "As my children grow older, I hope to continue to impart a love and pride for New Orleans. No matter where life takes them, it is my dream for my children to always, always come home to the Crescent City." My hope is to pass this love for New Orleans along to my children by embracing all that the city has to offer. For now, that means enrolling them in a New Orleans school, and fostering their love for what makes this city special; currently, we spend many days at Audubon Zoo and the French Market, and we try to catch Johnette Downing shows when possible. As my children grow older, I hope to continue to impart a love and pride for New Orleans. No matter where life takes them, it is my dream for my children to always, always come home to the Crescent City.